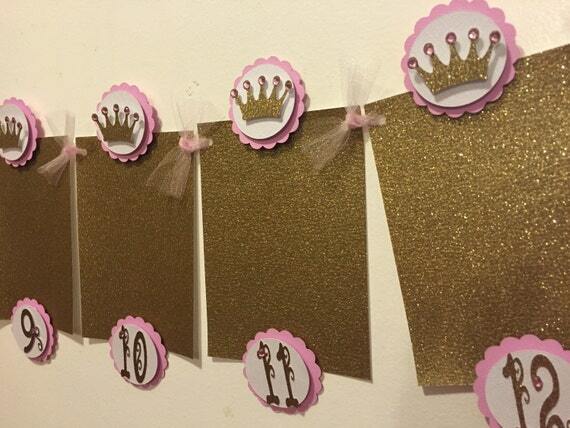 Make your little princess’s pink and gold birthday party even sparklier with this charming newborn to 12 months photo banner. Each double layered shape is about 4.5″ and are connected with gold ribbon. 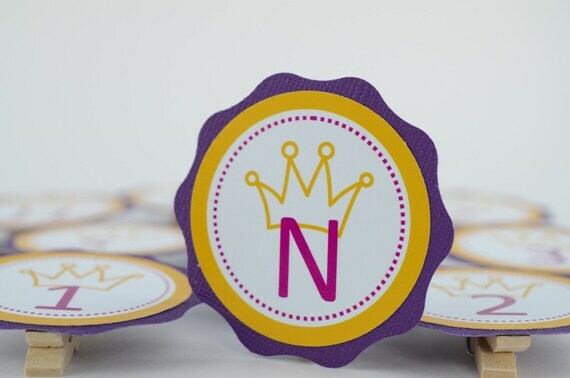 The letters and the crowns are made out of high quality glitter card stock. A pin for easy photo attaching is glued on back of each circle. 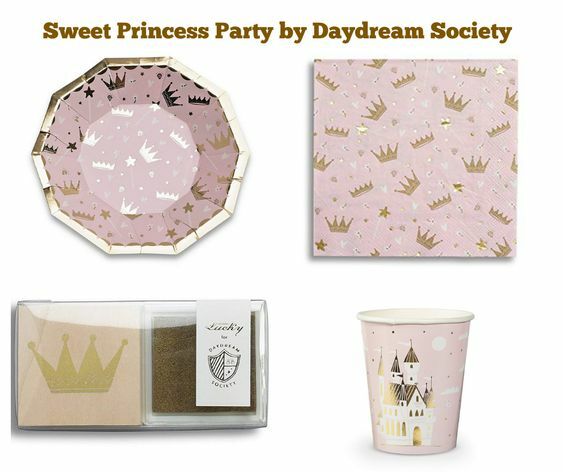 Our gorgeous Royal Little Princess Party-In-A-Box will have you party ready and set to impress. 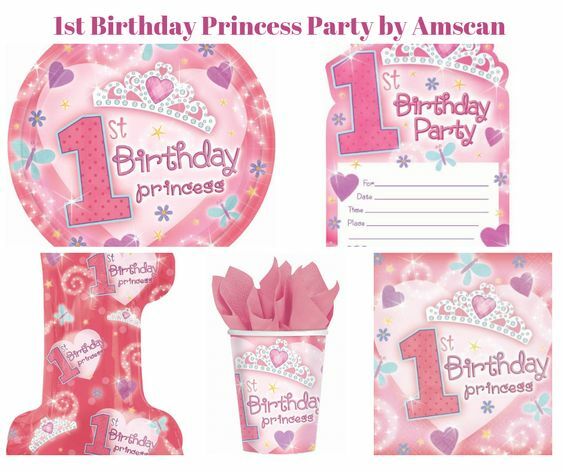 Let us add a CHARMING TOUCH to your event with our Girl First Birthday Princess Party Decorations. 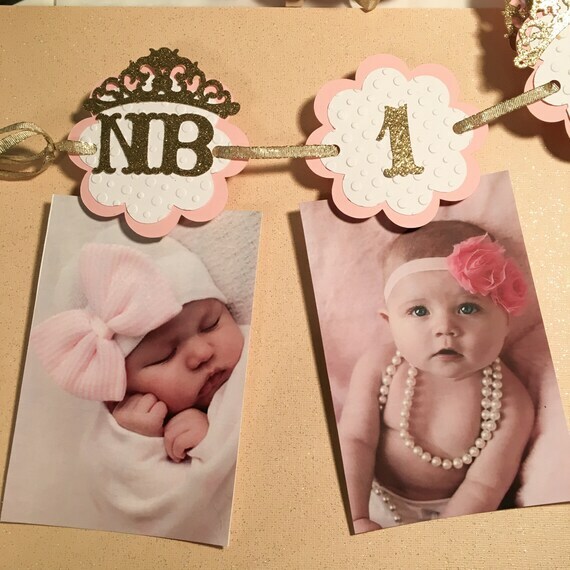 This listing is for a photo banner that displays pictures of your princess from birth until her first birthday. Each rectangle measures 5×7 and hold a 4×6 picture. By gluing or taping it to rectangle. Message me if you would like a different color scheme or have a different theme. 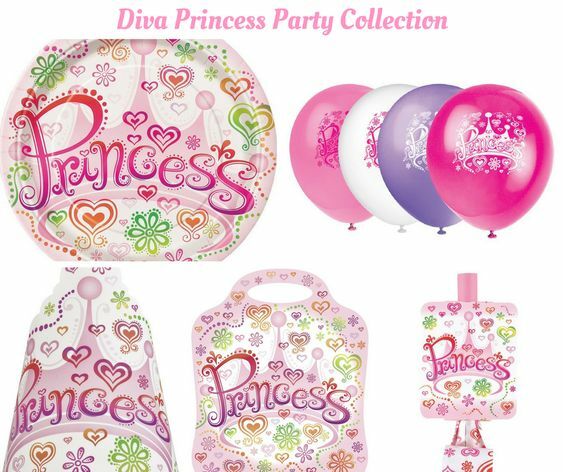 Let us add a CHARMING TOUCH to your event with our Girl Princess 1st / First Birthday Party Decorations. BASIC — Comprised of two layers of card stock — one backing layer (color of your choice), and one layer with the text (i.e 1 month, 2 months, 3 months….etc.) This version will NOT have the 2″ circles with graphic images on every other month banner flag. There will NOT be pearl accents on the basic banner. 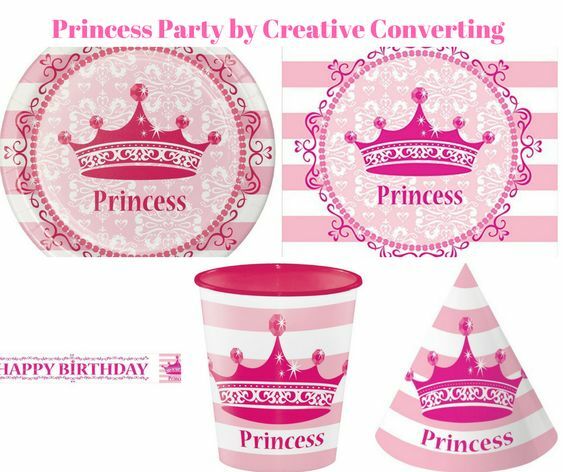 The end cap spacer flag will have THREE layers of card stock and will include princess crown image. DELUXE — EXACTLY AS SHOWN IN THE LISTING PHOTO. Comprised of 4 layers of card stock — 3 backing layers in various colors (pink, gold, bubble gum pink) with one layer pastel pink card stock with text (i.e. 1 month, 2 months, 3 months, etc.). Every other month banner flag will have 2″ circles with coordinating graphic images. Each banner flag is embellished with precious pearl accents for a special touch. 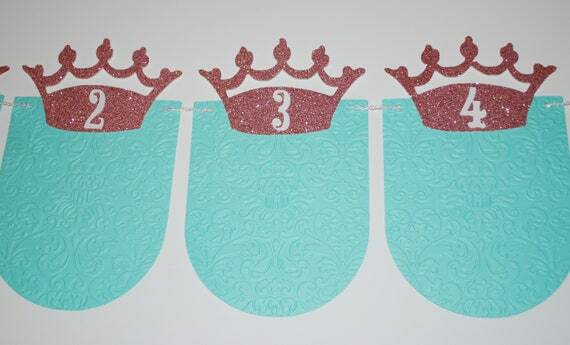 The end cap spacer flag will have 6 layers of card stock + graphic crown image. 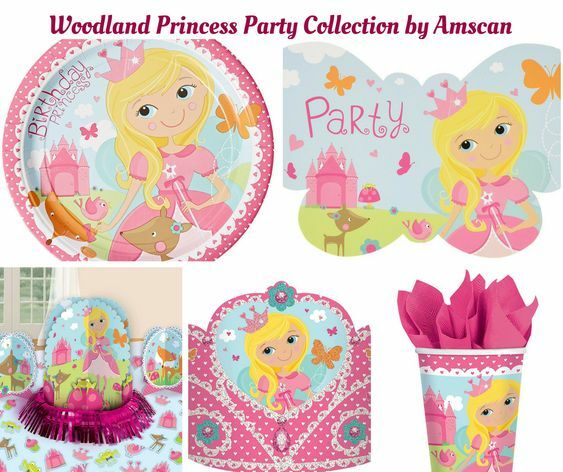 Let us add a CHARMING TOUCH to your event with our Girl Floral Princess 1st / First Birthday Party Decorations. DELUXE — EXACTLY AS SHOWN IN THE LISTING PHOTO. Comprised of 4 layers of card stock — 3 backing layers in various colors (gold shimmer, mint green and white) with one layer pastel pink card stock with text (i.e. 1 month, 2 months, 3 months, etc.). 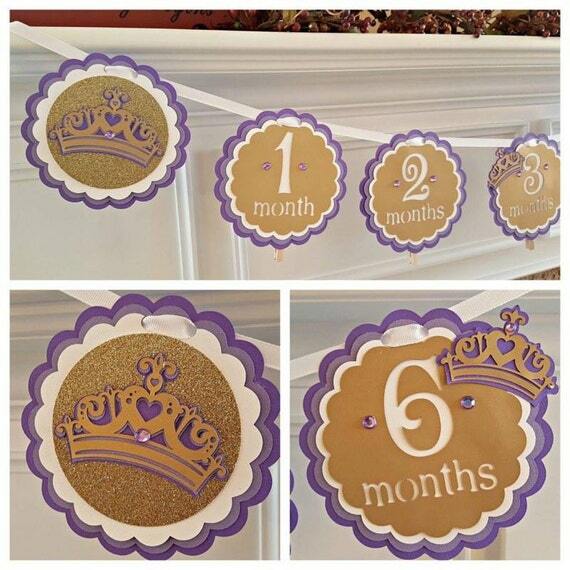 Every other month banner flag will have 2″ circles with coordinating graphic images + die cut princess crowns. Each banner flag is embellished with precious pearl accents for a special touch. The end cap spacer flag will have 6 layers of card stock + graphic floral image. 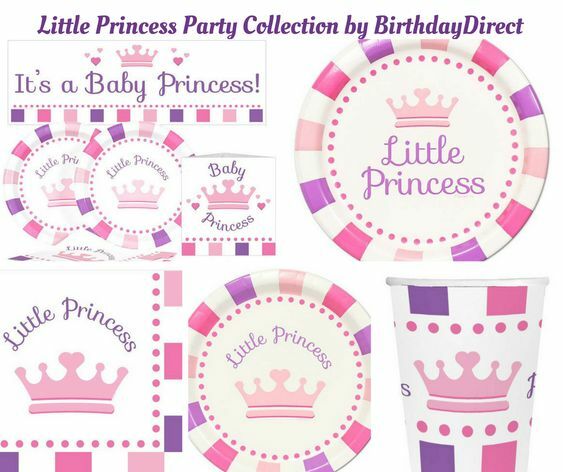 Let us add a CHARMING TOUCH to your event with our Girl Lavender and Purple Little Princess 1st / First Birthday Party Decorations. 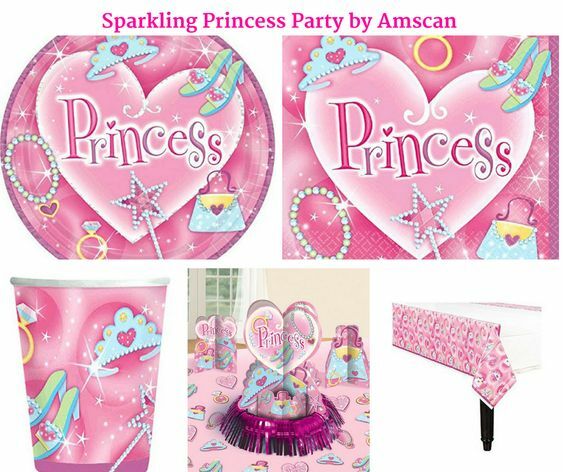 This Perfect Princess photo banner will be a show stopper at your next party. It features 12 photo cards -each are 4.5 by 6.5″ that will accommodate your 4 by 6 photos, and are connected with tulle to a length of approximately 5 feet. 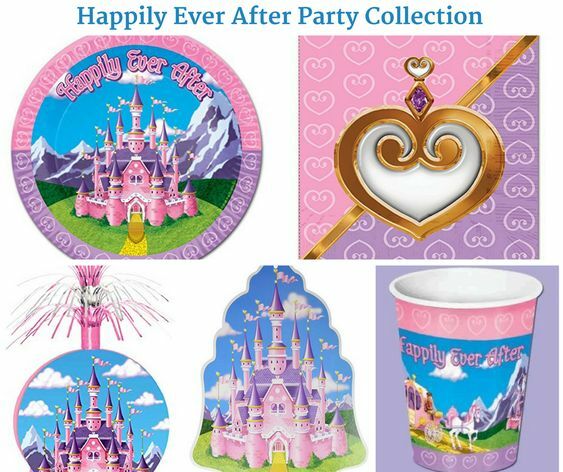 The photo holders are glittery castles, rings and crowns. 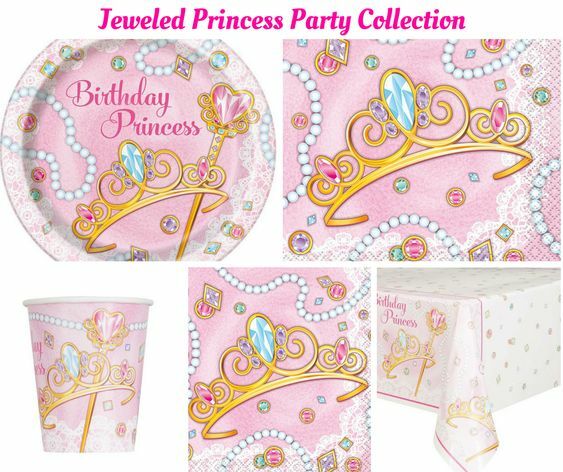 The crowns also have 5 gem embellishments to make them sparkle and shine. Each photo holder is back by a small or miniature clothespin to allow you to rearrange or assemble as you like but also can double as favors after your big event. Hang this anywhere in your home with command strips for a temporary display or display outside for a summer event. Display your child’s favorite photos from the year or their monthly photos as a baby (Newborn – 12 months). 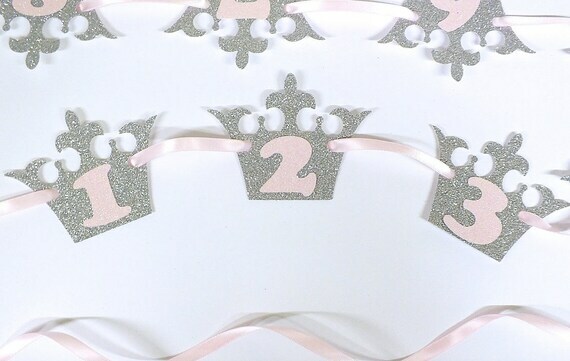 This beautiful PRINCESS Newborn through 12 month photo banner will be a beautiful showpiece at your new birthday event! 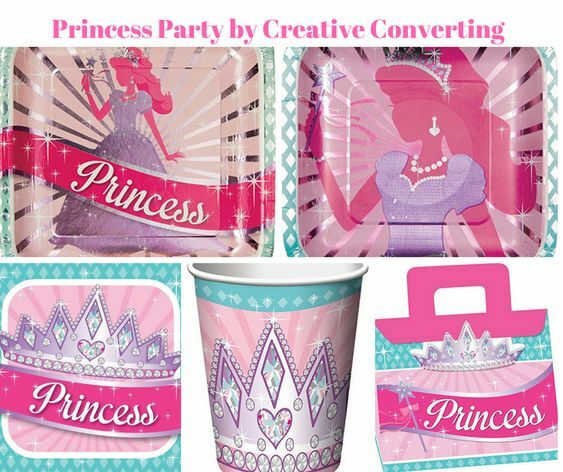 As shown this item features pink, grey and white color coordination, however you can color customize this item as you desire. Each patterned frame (13 of them) is accented with an inner solid 4.5 by 6.5 frame to perfectly frame in your 4 by 6 inch photos. The pink circles on the top have shadowed lettering and numbers to accent the color coordination. 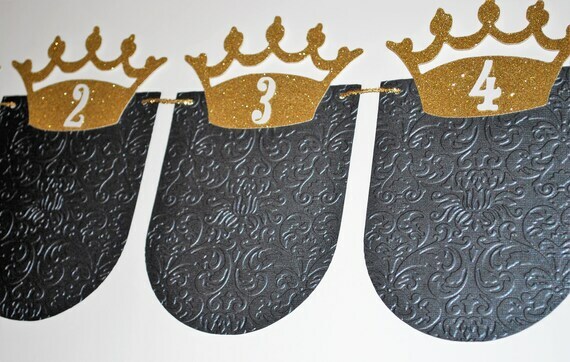 Castles and crowns with gemstone accents are embellished to add a unique theme to this banner. Banner is strung together with shimmering tulle and spans to just over 6 feet long. 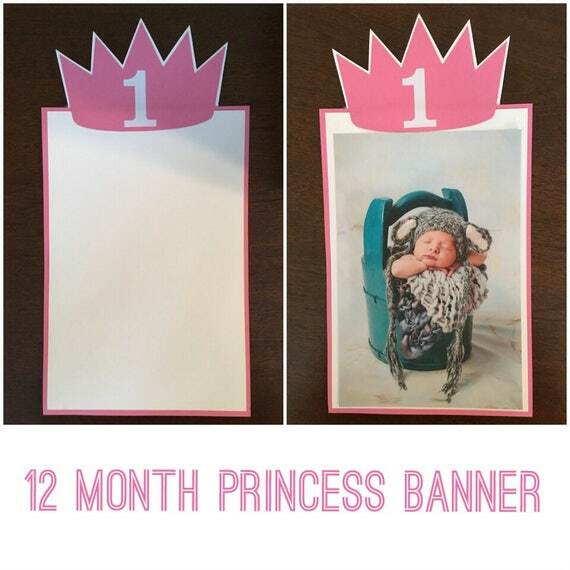 This photo banner is designed to hold 13 photos from Newborn to 12 Months. Each photo backdrop is 7.5 by 5.5 and topped with a coordinating 6.5 by 4.5 sold paper so that you can display your 4 by 6 inch photos and still see the background patterns and colors. They “frame” your picture beautifully. 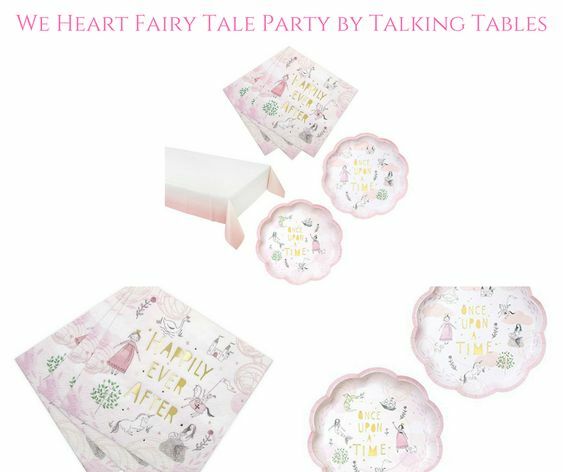 They are strung together with white and purple glitter tulle – perfect for a princess! 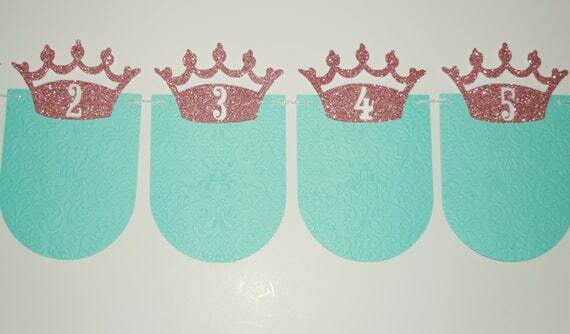 This princess theme banner has castles with N (newborn) and 1 -12 on each individual castle and each is embellished with 4 gems for a sparkling display. 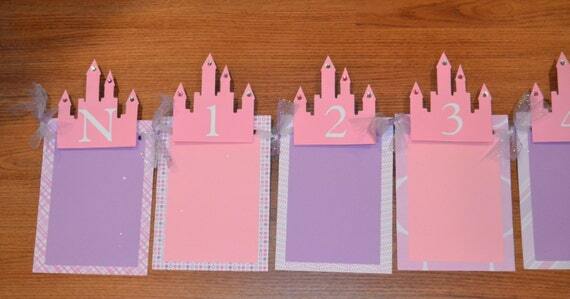 The castles are designed on a clothespin so you can easily attach your photos for display. 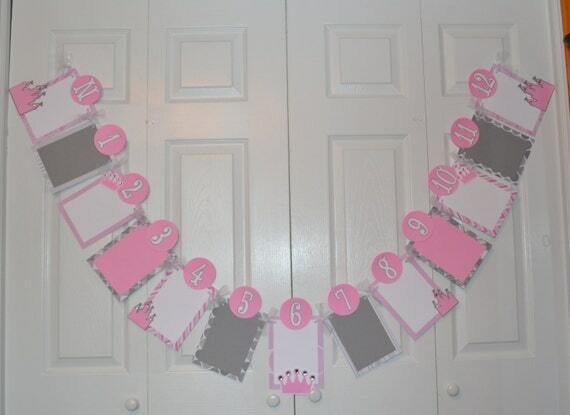 This would not only be a beautiful way to display your child’s photos at their first birthday party and can also be used as decor before or after the event. Customize your own banner 😊. My banners are great for party decor or photo shoots. The banner starts 0-12 months. 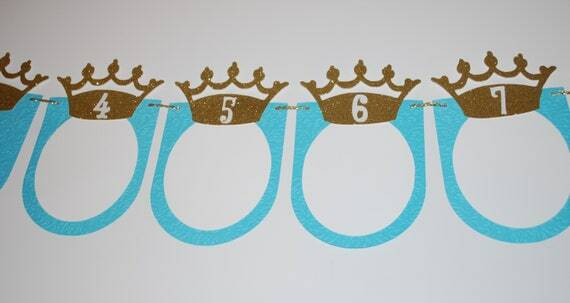 Each includes the crown with the appropriate number. I leave 25″ of extra twine on each end. If you need more please simply let me know and I will be happy to add extra! This pretty 12-month photo banner might be the perfect accent for your baby’s Snow White-themed first birthday celebration. The pretty yellow, sparkly gold, true red, and primary blue in traditional Snow White colors, go great together with the damask texture. 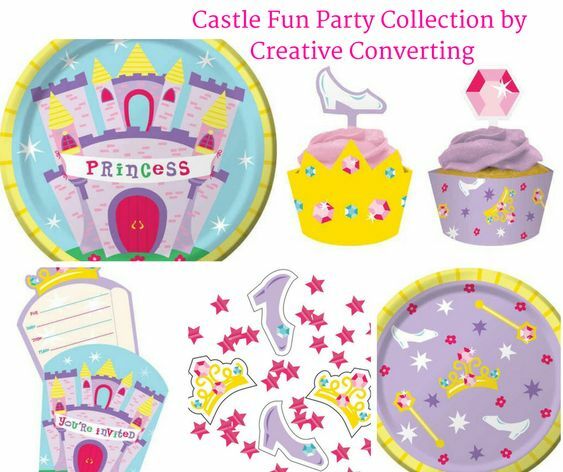 Once the party is over and pictures have been taken of the big event, the banner can serve as a great keepsake, could maybe be part of your scrapbooking or added to your baby’s nursery decor. 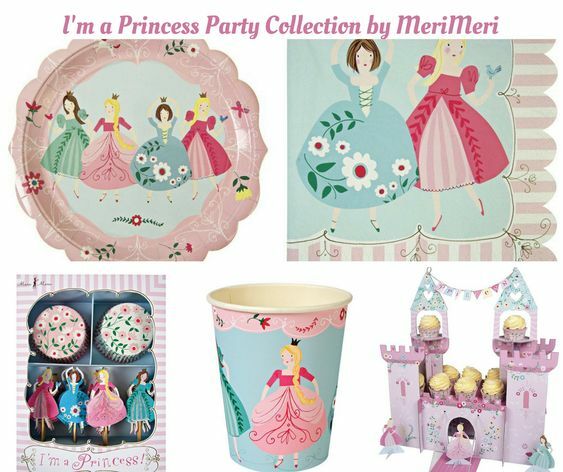 This is a great way to show off your baby’s first year at their princess 1st birthday! 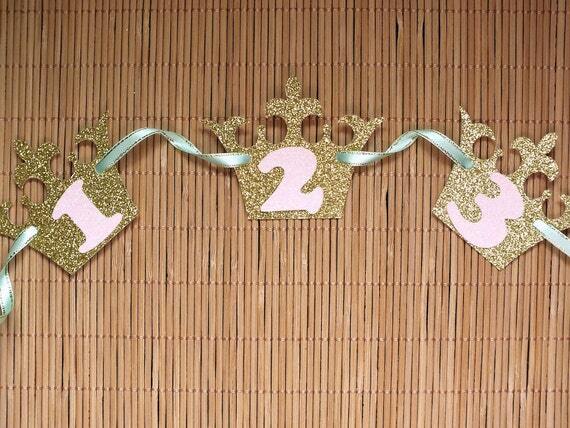 This banner is big enough to easily see the photos, and adds a great decor to your Pink and Gold 1st Birthday party. Several ways to purchase this item, to accommodate your varying needs – please read below in full and if you have any questions at all, send me a conversation – I answer quickly! ★ Printed on 100lb gloss cover – backsides are blank white. 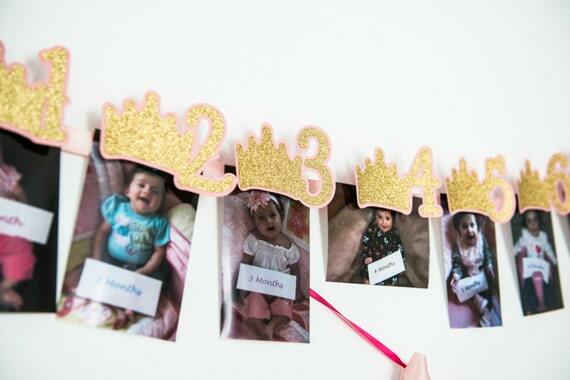 This pretty 12-month photo banner might be the perfect accent for your baby’s Princess-themed first birthday celebration. The aqua and sparkly gold colors go great together with the damask texture. 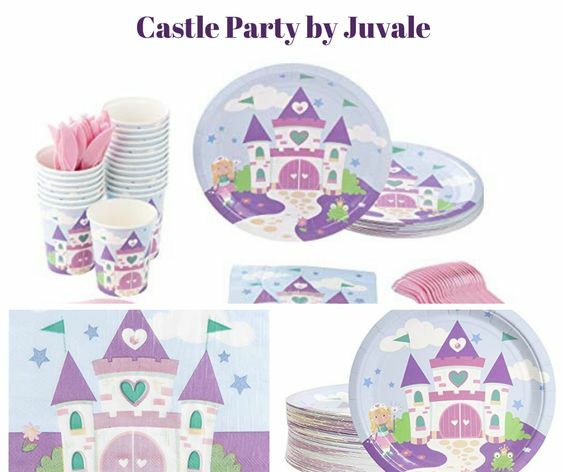 Once the party is over and pictures have been taken of the big event, the banner can serve as a great keepsake, could maybe be part of your scrapbooking or added to your baby’s nursery decor. PLEASE FULLY READ THE DESCRIPTION BEFORE ORDERING. THANK YOU! The banner consists of 12 paper pennants in an aqua color. Each pennant has been embossed with a beautiful damask pattern adding a hint of sophistication. 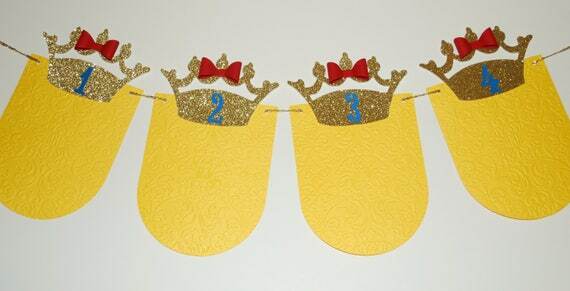 A sparkly gold crown is placed at the top of each flag, and a shimmery white number lays on the center of each crown. The banner is one-sided only. BIGGER BANNER: Each pennant measures approximately 4.75″ x 6″, (with crown included it is about 7.75″ in height). They can hold a photograph size 4″ x 5″ (oval shape). A piece of white cardstock (in that size and removable), is provided for each pennant so that you can adhere your baby’s photograph to it. 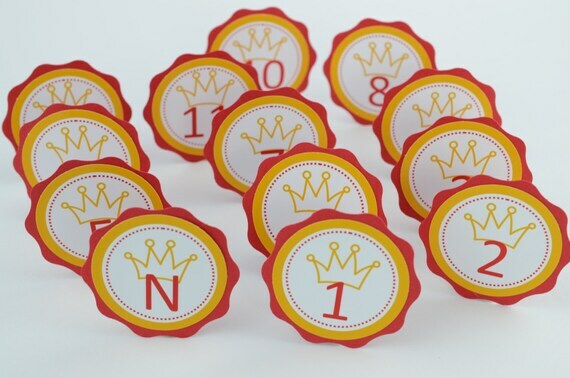 This will make it easier to attach your baby’s photographs to the pennants by sliding it under the crown. You will have to use a small amount of temporary or permanent adhesive (your choice) on the back of the white cardstock pieces to keep your photographs in place. A piece of clear acrylic paper (same size as white piece), will also be provided to help you when trimming your pictures. If you prefer a rectangular matting (4″ x 4.75″) for your pictures instead of the oval shape, just let me know in the notes section. The length of the banner is a little over 5 ft. Plus it will include an extra 12-14″ of sparkly gold cording on each side for hanging (might not be the exact same one you see pictured depending on availability, but it will be similar). You can easily slide the pennants on the ribbon to achieve the spacing you would like. 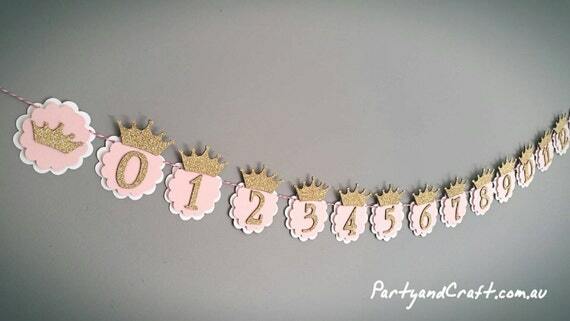 This pretty 12-month photo banner might be the perfect accent for your baby’s Princess-themed first birthday celebration. The lavender and sparkly silver colors go great together with the damask texture. 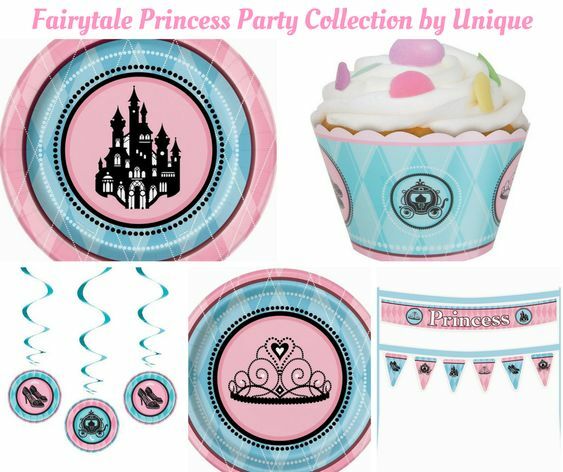 Once the party is over and pictures have been taken of the big event, the banner can serve as a great keepsake, could maybe be part of your scrapbooking or added to your baby’s nursery decor. 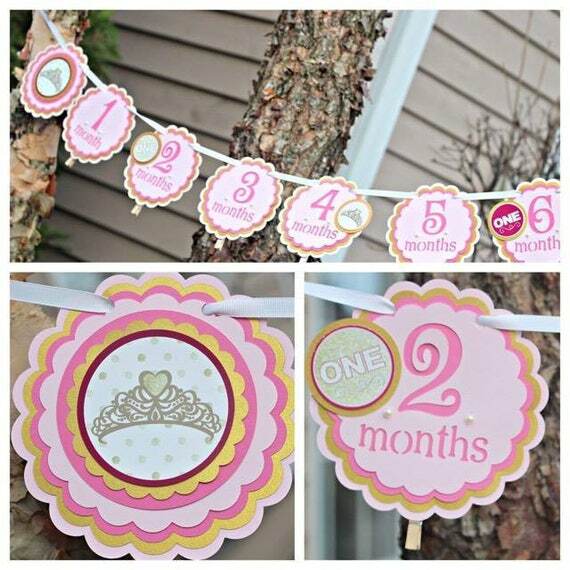 This pretty 12-month photo banner might be the perfect accent for your baby’s Princess-themed first birthday celebration. 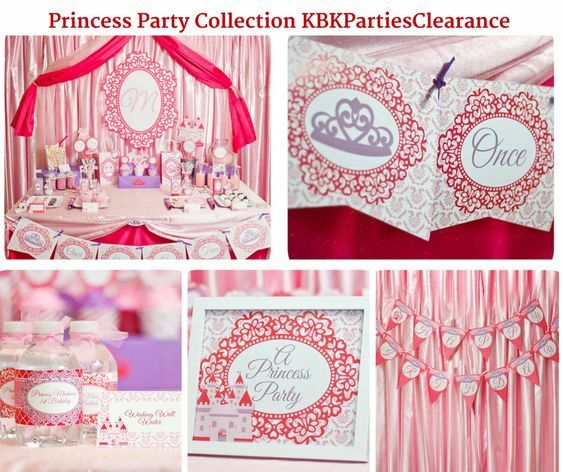 The mint and sparkly pink colors go great together with the damask texture. 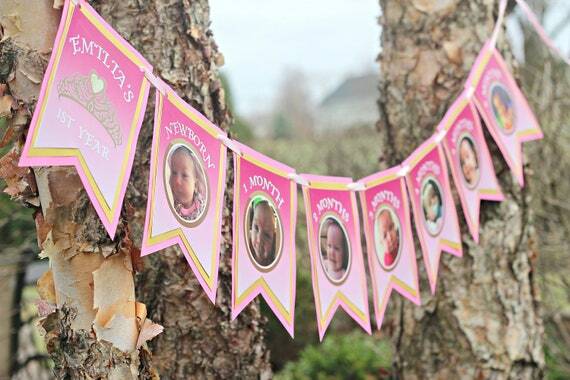 Once the party is over and pictures have been taken of the big event, the banner can serve as a great keepsake, could maybe be part of your scrapbooking or added to your baby’s nursery decor. Each piece can easily be moved to be spaced closer or farther apart, which will affect the exact length. Just attach a photo using Double Sided Tape. Each Flag measures 6 x 5 inches. Colors used are Pink and Gold. Curling ribbon to hang from. 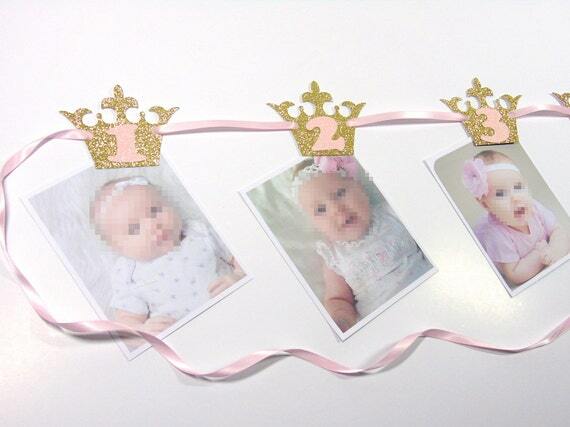 Our Princess Theme Photo banner is the perfect way to display your baby’s photos from newborn to 12 months! 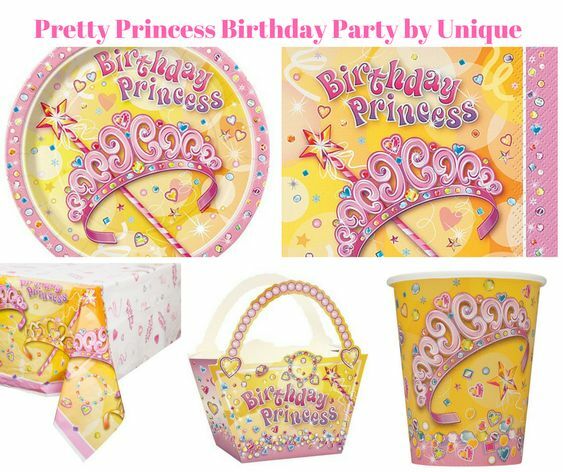 Ideal as an addition to your Princess Theme Birthday Party, this birthday banner can be draped across a mantle, gift table, or act as part of a photography prop. Banner comes pre-strung and has clips on the back to easily hang your photos. Our photo banner features 13 Cards displaying newborn to 12 month. It is made from card stock and strung with ribbon and has clothespins on the back of each circle so that you can easily attach your photos. The banner is 5 ft (1.5 m) long. The crowns are 3″, the ribbon is 9ft (2.7 m). The samples of the pictures are 4″ x 6″. Strip of glue on the back side of the crowns. 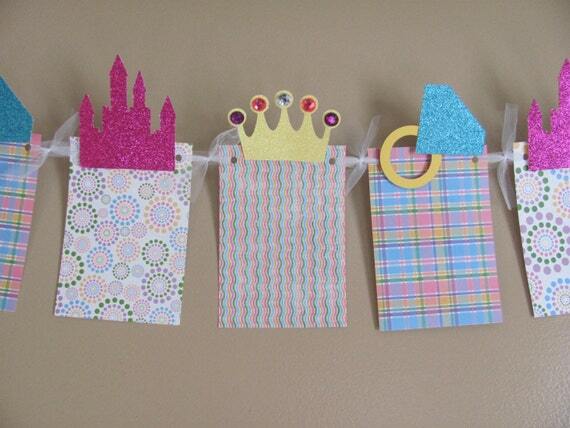 This first year photo banner is for newborn to 12 (Dec) and 2 princess crown flags. Please always, ALWAYS inform me your event day! Even though you need the banner in a couple of month! Urgent orders I send in 1-2 days, others in up two weeks. If I know your time-limit, I can guarantee 100% that you will get the banner on time! 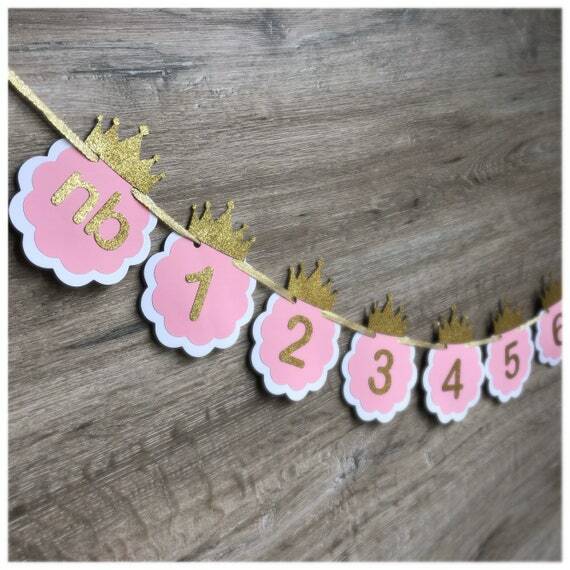 This listing for the gold photo banner with pink numbers and mint ribbon. 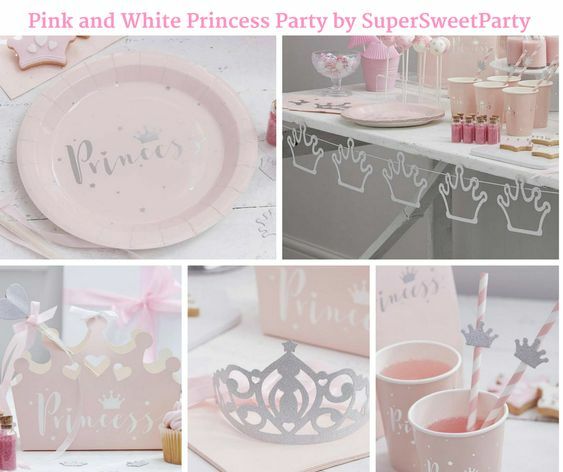 Just imagine this adorable Princess First Year Photo Banner adorning your little one’s room and then be a focal point of their 1st Birthday Celebration. This is also the perfect baby shower, or birthday gift. 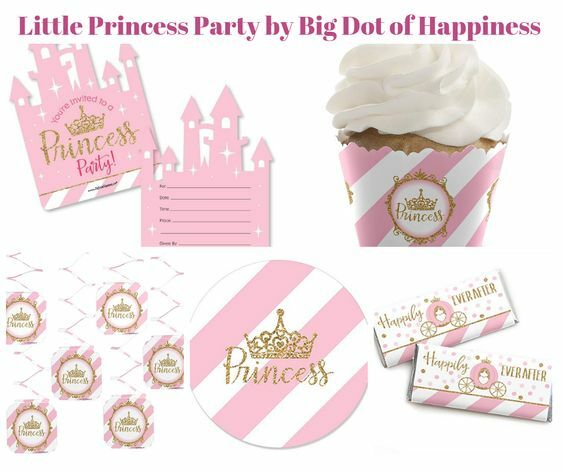 The banner measures about 50 inches and it is made with high quality, acid free, and lignin free pink card stock layered with a peice of polka dot embossed white card stock. Each piece measures 3.5 inches and has a clothespin on the back for easy picture assembly. 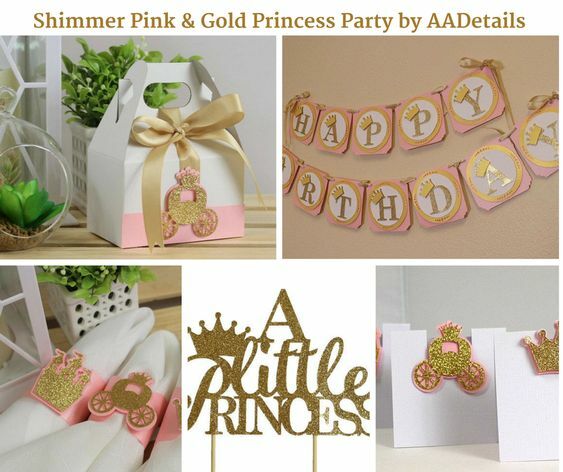 The letters are made out of gold glitter cardstock using a fairy tale story book font. The crowns add an extra royal touch. The banner is tied together with gold satin edged organza ribbon to give a luxurious touch. You can choose an additional shape to be added to personalize with your little ones name. 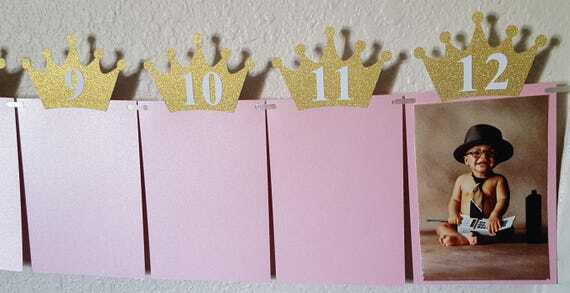 The photo clip comes in a set of 13 Newborn to 12 Months to display a photo of your baby from birth to 1 year. They are made of 2 or 3 layers of cardstock. Attached to the back of each tag is a small clothespin (not visible from the front) that allows you to attach the clip to the ribbon and hang your photo. 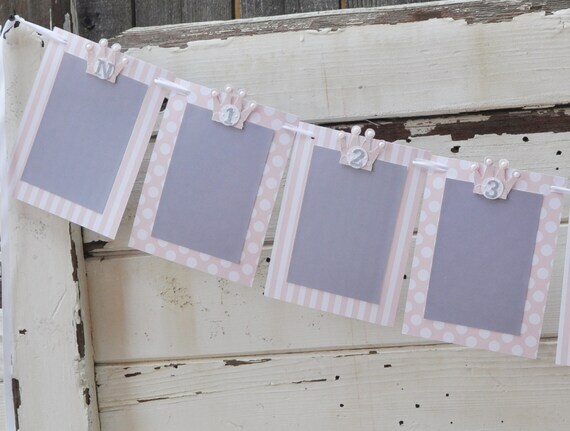 This is a listing of the photo banner in SILVER and PINK. If you would like it in other colours, send me a message. 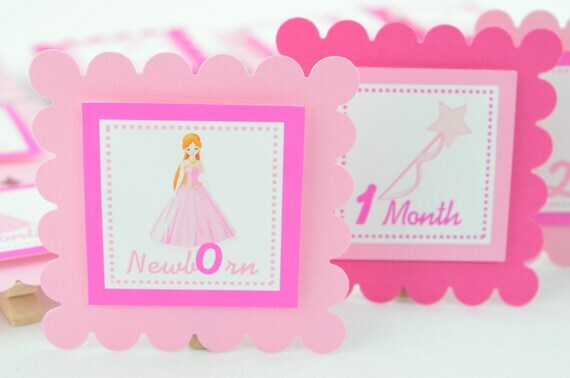 This pretty 12-month photo banner might be the perfect accent for your baby’s Princess-themed first birthday celebration. The black and sparkly gold colors go great together with the damask texture. 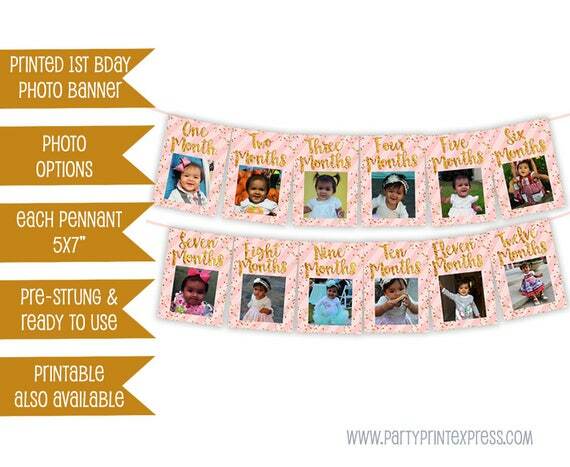 Once the party is over and pictures have been taken of the big event, the banner can serve as a great keepsake, could maybe be part of your scrapbooking or added to your baby’s nursery decor.